It was to be expected, and nothing more clearly illustrated the gap between the uncaring rich and the 99 per cent. On the day when many thousands of people from across Britain poured into London (and elsewhere) to demonstrate against the Tory government’s austerity measures, high society poured out of London to attend the last day of racing at one of the main events of the summer season for the privileged – Royal Ascot . While coaches, buses, cars and trains decanted protestors, Waterloo Station was awash with top hats and posh frocks waiting to board the Ascot train. Up to 250,000 people came to London and no one can argue that the demonstration, organised by The People’s Assembly, wasn’t representative of the broad spectrum of people’s anger against Tory policies, policies that have seen vital budget cuts affecting so many people, with the poorest targeted more than most, and the rich not at all. None of the cuts have affected them, their friends the foreign ‘investors’ who have bought up half of London, or the global corporations. Many international companies pay little tax and make use of “zero hour contracts ” which allow the government to point to the rise in employment while ignoring that such jobs can make people poorer. Instead of those who need it, tax payers’ money will still subsidise the arms trade and arms deals with dodgy regimes, nuclear power and underwrite vanity projects such as the unnecessary, unwanted and environmentally damaging high-speed-train line. Every major and minor union was there, with many people calling for a General Strike. 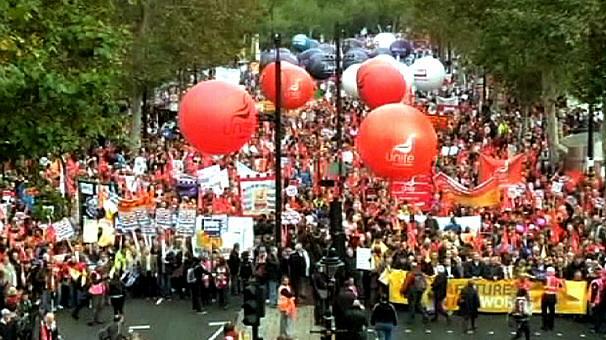 Tories don’t like trade unions and want to curb their right to strike even more. Give them enough room and they’ll outlaw that right or create so many legal hoops for unionists to jump through it will be all but impossible. All public services were represented. Even those which are supposed to be ‘protected’ from the cuts are suffering from knock-on effects. Teachers’ unions large and small were there, and Christine Blower, head of the National Union of Teachers (NUT) was one of the speakers. The National Health Service, rightly the pride of the British and envied by the poor across the world for its accessibility to immediate treatment and care, is under threat. Struggling with debts caused by the Private Finance Initiative deals, and with Tories eager to privatise as much as they can get away with in order to ‘balance the books’ (too many Tory MPs have connections with private healthcare firms), NHS staff are struggling. From surgeons and theatre staff marching in their scrubs to child psychotherapists, nurses, porters – all those who could be there were there. The Fire Service has had budgets cut and fire stations closed or ‘rationalised’. The London Fire Brigade suffered the closure of 10 Fire Stations last year with the inevitable redundancies – they came with their fire engine. Police forces across the country are facing budget cut and officers made redundant as a result. That could be why the many police on duty were far more friendly than at previous demonstrations – no sign of the ‘heavy brigade’, dog handlers getting their police dogs to leap at passing marchers or attempts at ‘kettling’. On the other hand, Whitehall (down which the marchers went) and Downing Street (past the entrance of which the marchers walked) were in lockdown. One policeman grinned when asked, “Is he at home – or at the Races?” Well, of course David Cameron wouldn’t be there – if he’s nothing else, he’s gutless. I have never seen such barricades against demonstrators, even in the days of the invasion of Iraq. Double barriers, chained, weighted and padlocked; even the most important thing in Whitehall, the Cenotaph, memorialising the dead of British wars from WWI onwards, all boarded up because the last time anti-austerity campaigners passed this way, someone left a rude message on the Women of World War II memorial. Boarded up and guarded by police, the words carved in the stone above them stood out – “The Glorious Dead”. Quite. As they poured through Trafalgar Square into Whitehall, each group roared and cheered as it saw Big Ben ahead – the end of the march from the City (the source of financial woes) to Westminster (the source of all the other woes). The noise echoed all the way down Whitehall as wave after wave of marchers passed. Anti-racist organisations were there. Pro-immigrant organisations were there. European supporters were there, including Greeks with Syriza placards. The Green Party was out in force, as were all the Socialist and Communist groups. Labour Assembly Against Austerity were there (not all the Labour Party is cowed by the Tories – witness Jeremy Corbyn, standing in the leadership election). No Conservatives though. We Are Not A Loan! Peace, freedom, and a fewer fat bastards eating all the pie! Everyone had a story to tell, personal reasons for demonstrating. For one man it was anger over the banks that had caused the financial crisis, and the taxpayers’ money that went to bail them out, at a cost of about £55,000 per tax payer. He was angry that George Osborne was proposing to sell off the publicly-owned part of the Royal Bank of Scotland at a huge loss to the taxpayer. Our money, he said, ours! He had come with his own leaflets on this and other issues (like the NHS and TTIP) to hand out as he marched. One London woman said that although she personally had not been affected by the austerity cuts, her local school could not employ good, or indeed, any teachers because there was nowhere in London they could afford to buy or rent a home. Another woman knew a public health worker forced to commute into London every day from the south coast because, again, she could not afford any kind of home in London. But then, she must have been spending a major part of her salary on rail fares. And from one disabled woman, a story to tear the heart. She had managed to travel up from Kent to join all the other disabled protestors. She said she was willing to say why she was there, but when I asked if she had been affected by the cuts (and remember, George Osborne has another £12 billion cuts planned for welfare spending) she started to speak, then her face crumpled and she broke down. She was living on a knife-edge. Just about surviving the cuts already made to her welfare payments, she was terrified what the next tranche of cuts would do. She didn’t know if her family would be able to offer any more help for they too were stretched. “But I have made my plans,” she said. Here was a woman who was intelligent, articulate and caring of other people, who had the misfortune to be confined to a life in a wheelchair. “But I have made my plans,” she said. The government has refused to make public the figures showing how many people have died after their welfare payments were stopped or slashed. And taxpayers expect their taxes to pay for welfare, for nurses, firemen, ‘bobbies’ on the beat, dustmen, teachers, carers… Most do not pay taxes simply to provide incomes for politicians who think the poor are a drag on society. David Cameron, George Osborne, and all you other rich men who ‘lead the world’ and think money is the only reason for living – may you rot in hell for what you are doing to people like her. People need Hope not Fear and it is clear that none of the former is likely to come from Westminster unless you belong to the top 1%. The alternatives are clear to the people of Scotland but England has yet to wake up to the fact that only the energy that is unleashed through mass action will bring about major changes that will benefit the population as a whole. I trust the marches will continue and grow to such a size that chains and padlocks will be unable to contain them. I think you’ll find that those on the march were predominantly English…but with many from the home nations and further a field. But you’re correct in one way, when working class English voted Tory, they’ll reap what they sowed…unfortunately that’ll affect all of us as well..
More correct to say predominantly British as there were many black people of various ethnic origins there. I didn’t expect to see any Scottish group as I knew they’d be marching in Glasgow. But groups had come from all over England (including the far north and the Isle of Wight) and Wales. No specifically Muslim groups, but then local mosques are extremely good at looking after their own (and making up for the shortcomings of our current welfare system!!). The Peoples Assembly say that in the 2 days after the march, there were emails from 8 different regions asking how to set up local Assembly groups. Protests are planned for July 8th, when Osborne presents his next lot of cuts and I think there will be even more angry people after that. I really envy the Scottish political engagement. We “English” are slow in reaching boiling point (something to do with being phlegmatic) but we are getting there. And please remember that 75 per cent of the electorate did NOT vote Tory – we are all of us suffering from the FPTP system that delivers us into the hands of the wrong people. Unfortunately, if you add the Conservative votes and the UKIP votes, that is 50% of the votes cast throughout the country. And it is not as if what either of them intended to do to government spending was a secret. Cameron’s Tories got 37% of the vote – that is better than any result for Tony Blair. Cameron is certainly not a lame duck. Please be realistic instead of saying that hardly anyone voted for any of this. This is the beauty of alternative media. Real insight to real life. Imagine if it could be expanded! Does anyone know roughly how many people attended the Glasgow demonstration? I have heard very little about it. Good stuff, Lesley, it is indeed vital for us all not to allow ourselves to get lost on the sterile plains of national bigotry and prejudice. Fact is that the Cameron government’s vile plans, paper thin majority and internal divisions are even now beginning to make it unsustainable across the whole UK. A great groundswell of public opinion and anger against the basic unfairness of Tory policy is welling up and will become unstoppable. This added to by Cameron’s own public performances – hectoring and ranting at the poor, weak, defenceless and those who don’t support him, while toadying up to those wealthy, tax-avoiding self-interest groups who do. There are reminders of the poll-tax about all this, and that, of course, brought Thatcher down. Not that that would really worry Cameron – he’s a lame-duck PM already having given notice of his intention to shuffle off into the green grass of his own comfortable budget-less future before the next election. Signs are he’s going to leave a real mess of potage for his successor, though. Good article. SNP London Branch were almost the march in London and were interviewed by Channel 4 and RT.